Last week it was announced that Brian Tyree Henry (Atlanta) would be joining Millie Bobby Brown (Stranger Things, Godzilla: King of the Monsters) and Julian Dennison (Deadpool 2 ) in Godzilla vs. Kong. 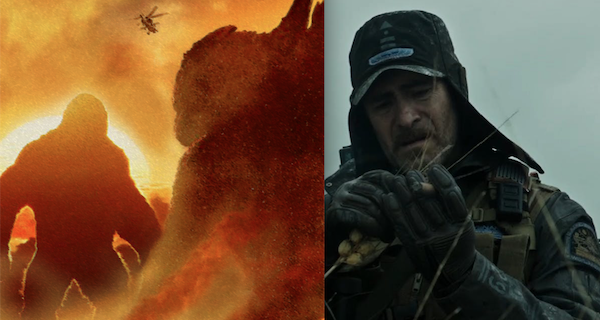 Director Adam Wingard's kaiju epic now adds another name to the cast, Oscar nominee Demian Bichir, known best from Alien: Covenant (2017) and recently, The Nun (2018). Like Henry and Dennison, not much is known about Bichir's role in the film. Bichir was nominated for Best Actor in 2011's A Better Life. Godzilla vs. Kong stars Millie Bobby Brown (Stranger Things, Godzilla: King of the Monsters), Julian Dennison (Deadpool 2), Brian Tyree Henry (Atlanta), Demian Bichir (The Nun, Alien: Covenant), Zhang Ziyi (Crouching Tiger, Hidden Dragon) and Van Marten (Avengers: Infinity War). The film is directed by Adam Wingard based on a writers room story led by Terry Rossio. Alex Garcia is producing. G. H. (Gman) That's awesome. I hope he gets a major role (or at least, a good role) in Godzilla vs. Kong in 2020. Also, have you seen (or can you please see and comment on [positively]) Xenotaris' Gojiverse forum? It does have characters in it (a bunch of them actually, each with their own story lines), and I actually think it might be good enough and developed enough (even though it is still being written by Xenotaris) to become a prequel to something like Toho's "World of Godzilla" (At least, in my opinion.). You've got to check it out. Please. I highly recommend it to everybody reading this, too. It's an interesting idea and it should get more attention. Oh cool. I did saw Alien Covenant but not The Nun but that's cool. I'm going to see it always because of Millie Bobby Brown. She's my favorite actress and whatever movie she's in, I'll watch.